Worsted weight yarn. set of 4 double pointed needles 3mm. Please note: The needle size is a general guideline for these mitts. The Briggs and Little Heritage was a tight knit with the 3mm needles (almost too tight for knitting but I used the 3mm needles because that is what the original pattern said! 4 or 4.5mm would probably been better!). No matter what yarn you use, use what ever needle is suggested. Just do a swatch and see how many repeats of the 6 stitch pattern is needed to go around the intended wearers’ hand. By the way, the tightly knit mitts relaxed and were a perfect fit and the wind does not blow through them! Gauge for the sample: 6 stitch repeat came out at 1 inch after relaxing and just, oh so slightly, smaller before. With A cast on 42 sts. Following Row: Purl, increasing 2 sts on each needle for a total of 48 sts. Section 1: *K4 with B, Sl 2 purlwise with A*, rep. to end of row. Rep. this row 4 times, 5 in total. Purl 2 rows with A. Section 2: K1 with B, * Sl 2 purlwise with A, K4 with B* rep. to end of row. Important: Ensure that yarn A is left hanging in the back for this row. Alternate these two sections to achieve pattern. Thumb: On the last of these sections where you Purl 2 rows: P2, put 7 sts on a stitch holder for thumb. Cast on 7 sts, purl to end. Purl one row. Knit the pattern 5 or 6 times (or until long enough). Row 2: *K4, K2tog. *, rep to end. Row 3: *K3, K2tog. *, rep to end. Row 4: *K2, K2tog*, rep to end. Row 5: *K2tog*, rep to end. Thread yarn through remaining loops and pull tight. Weave in end inside. Thumb: With A pick up the 7 sts from holder. Pick up sts to make a total of 12-14 **sts. Knit to fit length of thumb. Decrease: K2tog all around and finish as the hand of mitt. Sl – Slip stitch, in this pattern slip them as if to purl. K2tog – knit 2 stitches together. ** For my largish womans’ hands I actually repeated 2.5 of the pattern (5 sections) before the thumb, and had to pick up to a total of 16 sts for the thumb. Hi My name is Evelyn and a friend asked me to make her a pair of mittens and she won’t take them unless I charge her.I have no idea as to how much .Do you have any ideas? Well Evelyn, You have to consider the materials used as well as the time involved. Since she is a friend, you might tell her you will charge for the materials as the actual knitting was done with love. I think you will find that hand knit items are sold for far less than what should be as people do it in their spare time, do it for fun and then sell it; not to make money so much as to raise money for new supplies. My mother, of 87 has made 58 of these mittens for her church. She tells me the church sells them for $8.00. She gets most of the yarn donated by members of the church. I agree with the other comment, that really, hand knitters should get more for their goods. I hope this helps. Give to her as a gift for her birthday, or Christmas, or I would suggest selling then for 20.00 a pair. Love this pattern. Have made at least 5 pair for friends. Am going to make myself a fingerless pair for keyboarding when my fingers get cold. these are just beautiful ! i knit and crochet a lot of mittens for the grandkids ans for what we call operation santa clause.i think i will addd this pair to the list this year. thank a bunch. relatives who live in Wisconsin and Maine. These mittens look wonderful. I love the colours! I’ll give them a try before winter for sure. The following direction reads: Ensure that yarn A is carried in back for this row. do you carry it in back and still slip the slip stitches purlwise? In the row you have indicated we are not really using A at all. We are leaving the working end in behind the work as we knit with B and slip the A stitches already on the needles. If we left the yarn A in the front it would end up being a loop in front of one of the colourful squares, which wouldn’t look very good. Thanks for the question. I’m sure it will answer for those too shy to ask! That makes life and knitting a lot easier. Greetings from someone else in the Maritimes! I saw people at a craft sale recently selling mitts like this, and I thought the pattern was nifty. I’d forgotten about them until stumbling across this pattern on a random search for other stuff. I get the feeling I’ll be knitting a few of these in the new year! Looking for a pattern for the Newfoundland mittens for kids. Thanks. I was wondering if you have the Newfoundland Mittens pattern in children’s sizes. I will work out a pattern for children soon but as you all realize, children come in many different sizes so the pattern will have to be altered to fit many ages. Thanks so much for the pattern. I’ve owned many mittens like this over the years (I’m a Newfoundlander too) and now that I’m a knitter myself, I wanted to make some for my girls. Hi: The pattern looks great but as I knit with one colour is the other colour left behind and the 2 slipped stiches not knit or purled. Thanks. Are the thumbs for left and right mitt knitted the same?? After 5 rounds those two slip stitches you will work them in. That is what makes the honeycomb pattern. Thumb works the same for right & left. As a Nova Scotianer, I saw many of these mittens on my friends hands as a child. I always wanted a pair, even as I started going to university and some of my friends were still wearing the warm mitts. I’ve made a pair before, but your pattern seems the clearest, and I love the idea of using Noro Kureyon! I’m making a new pair right now with Patons Classic Wool in Too Teal and Katia Mexico in a springy self striping colourway. Thanks again for the pattern! I tried to email you but couldn’t! I’ve been away on business and didn’t get your question until now! I do try to respond when I get question directly to the person with the question but sometimes it is worth while for everyone to see the answers! I does seem strange that you drop the colour A and just leave it hanging. You use the colour B and then just slip some of the previously knit colour A. It is not until after the honey comb like structure is created that you will pick up the colour A and purl two rounds while not touching the colour B.
I hope this answers your question Marjorie. If not please feel free to contact me at my email address. I’m always happy to answer questions. These mittens are beautiful – just what I’ve been looking for. Thank you for sharing your pattern. Hi, I am sooo glad to have found your website! My mother-in-law lives in New Brunswick and every year she sends up 3 pairs of these mittens for the kids. I have repeatedly asked her for the pattern but she never seems to get it to me!!!! Could you please tell me the numbers for kids sizes (s,m,l). I would really appreciate it!!!! I am having a ball knitting these mittens. Your pattern is very clearly written. These are going to be the warmest mittens in my collection. Thank you! Hi, I made one pair of these and almost immediately cast on for a second pair. I wanted a matching hat so using the instructions from your pattern I just made the circumference larger and worked out the decreases. I will be publishing it as a free pattern on my blog. Hi Angela did you post the pattern for a hat? Hi there…did anyone find the pattern for the hat? Can I please the patter for the hat, Angela. I bet it’s lovely. so excited to make these! thank you! Hi! I just love these mittens – but really really dislike knitting on dpns. Do you think it would be possible to knit this pattern flat on two needles? I started these as soon as I saw your pattern. I have an old pair (not sure where I got them) that I wear all winter. I am so excited to find the pattern. Doing my first pair with Lamb’s Pride Worsted (to use up some leftover from making a bag), but then I am going to make some in Briggs & Little Regal. Thank you very much for the pattern. i have made these and love them. was wondering if you have a pattern for kids. Getting this pattern for my aunt, hopefully I will get a pair too. Thanks so much for the great pattern, a crazy kniiter in my knitting group showed up with these mittens a few Wednesday’s ago and since I have made 3 pairs and a few other Ladies have made a few pair, I am currently working on the matching hat. Hi do you have a pattern for the hat to match these mittens? My honeycombs are coming out square and not round like in the picture…what am I doing wrong? When I slip the 2 stiches am I supposed to knit them again with the other needle? Help! Do you know anywhere they would have a video on how to make the thumb? This is my first pair of mittens and I don’t quite understand. I have been looking this pattern for years. I’ve even tried to knit pair for myself just by seeing a pair (that was not a succes). Never even thought that this would be Canadian pattern, since the pair I saw was knitted by a elderly Finnish woman (and with my experience they knit only with patterns they’ve learnt years ago). So, casting theese mittens on next week. Thanks once more. How much would you charge for a pair of mittens? 6 rows=$6.00. Therefore, kids sizes sold for less than adult sizes. It seemed to work well; no one suggested they were overpriced. When you reach the point that you are about to knit where the thumb is, slip those 7 stitches onto a piece of yarn and since your working yarn is on the wrong side in order to continue knitting you cast on 7 stitches which span the thumb hole and then continue in pattern on the other side of the cast off stitches. Pingback: Knit One, Purl Too: A Knitlog » Blog Archive » The most wonderful time of the year. Thanks so much for posting this…a friend of mine (very experienced knitter – thanks again Cheryl) made me a pair of these for Christmas this year, they’re wonderful!!! Pingback: Knit One, Purl Too: A Knitlog » Blog Archive » I’m back, baby! I love this pattern. I have a question. At the end of pattern two, when you purl the two rows in color A. Its seems that the first stitch on the top of the shell, has dropped down too far. The four knits in color B, are not even. Is this normal. I almost cried when I saw this on Ravelry. I’ve been searching for this pattern for years as my aunt made these for me as a child. I’d all but given up on ever finding it! Thanks…I can’t wait to try them! I love your ‘newfie’ mitts and have made a pair or two with red/white, Christmas mitts. 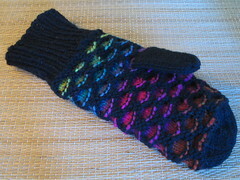 I knit ‘thrumb’ mitts that I call ‘newfie ‘mitts, they are REALLY warm and become quite waterfroof with wear. I took a course last year on the thrummed mitts. You are oh so right, they are REALLY warm. Haven’t worn them enough to become water proof, but I have no doubt! i have made your mittens, they are great, do you have a pattern for the newfoundland pattern you used for the mittens for a hat? I am wondering about the Section 2; if you start with 1 stitch B you actually end the row with only 3 stitches of B instead of 4. Anyone else have a problem with this. The three stitches of B at the end of the row match up with the single stitch of B you did at the beginning though, right? Which would make the four you need. The pattern came out okay for me. Starting section 2 with the single B stitch simply serves to offset the honey combs rather than stacking them right on top of each other. I hope I didn’t misunderstand your comment and was helpful! Thank you so much for posting this pattern! I grew up in Newfoundland but wasn’t a knitter until after I moved to Ontario, and then I couldn’t find the pattern anywhere! Then I came across this pattern on Ravelry. This is going to be my go-to mitten pattern from now on! I stumbled across this pattern when I was looking for the trigger finger mitts. I’m so glad I found them. I am on my 5th pair and have requests for several more pairs. My Mom was a huge knitter and I am so lucky to have her pass her passion for knitting on to me. She called the trigger finger mitts “Newfie Mitts” if you happen to have both a men’s and ladies pattern for them I would certainly love to make them for my family. Thanks again for sharing this wonderful pattern. did you find a pattern for the men’s and women’s newfie mittens? Thank you very much for the great pattern! I found it on ravelry.com and started it doubting whether I would actually be able to finish – but even though I am almost a complete beginner I managed within 3 weeks, thanks to your clear instructions! Beautiful mittens! Thanks for sharing the pattern! This past September me and my Big family visit Victoria,B.C. On Saturdays there usually farmer’s market with different kinds of stuff people sale:like homemade soap,jam, beautiful aprons, jewelry and more… Among those wonderful things I saw few pair of “just like your” mittens! They were GORGEOUS! Of course, I asked the owner to share pattern with me,but NO,No,No! It is a SECRET! THAN’KS GOD that we all have Real Friends who can share that pattern! In this moment my copy machine is not work. Using my hand I “copied” by hand lovely pattern,read it carefully,and decide that I need some help to understand.Hope I could find someone who will make clear “problems”. P.S.Please,do not laugh over my mistakes,I’m from Russia. Can u knit these mittens on 2 needles? I’m a beginner,of course I cannot!Think that 4 needle knitting is more comfortable to knit round. Well…May be there is some professionals? ohhh, I want to knit this patterns, but i don`t understand. Do you have a norwegian translation somewere?? Hi Marit, no I don’t have an official translation into any other language but google has a fabulous free translation service. There are other ones out there that will translate web pages to almost any language. Try it out!! I just found your pattern posted on google. I am a beginner . I have knit 2 needle mitts once. I hope I can do this. A friend of mine had a pair of these trigger mitts which he bought in Newfoundland 20+ years ago and unfortunately lost them last week in a rush to catch the train home. They were oatmeal coloured flecked with cream designed wool and although hugely sentimental – that bit cannot be replaced – would it be possible to try and request another pair to be knitted? It would mean so much to him and a big surprise if he knew – but would confess all when I hand them over if at all possible. I am in England, UK but happy to send bank transfer for whatever it costs and the wool and shipping….would love sooner rather than later (of course!) as I can’t tell you how upset he is over losing these gloves! If you could help, I would be very very grateful or if you know a website that has them – I prefer to buy from Newfoundland – it’s as close to the originals as we can get xxxxx Thank you in advance. Just reading this now June 6 2015. Did you get someone to make the trigger mitts for you? I do them with moose or puffin motif or the block design. Starting to knit stuff for craft table, I know it will take a good year to put this together, I had lost my pattern so glad you had it, thanks and now after reading your notes I know what to charge also. Love the bubble mitts been knitting them for years. Do you have a pattern for hats the same? Would appreciate it if you do. Thanks! I got a pattern off the internet!! It is free too!! Google Newfie Hat and Cowl and then click on the one that is ramswool.com/pdf/newfiehatand cowl!! it should come up !! I used Knitting worsted yarn for the mittens and the hat with a size 4mm needle!! Happy knitting!! Hi I’m having the craziest time with the thumb part of this pattern. I noticed someone else asked the question but I didn’t see your response, forgive me if I overlooked it. After placing those 7 stitches on holder you instruct to cast on 7 stitches — what type of cast on do you recommend and using which colour? It seems to me that I should include both colours and keeping in pattern but I’d like some clarification. I have spent more time “un”-knitting this part more than I have spend knitting and am completely frustrated at this point. Please help! I’m determined to finish these superb mittens!! when you put the 7 sts on a holder you should be doing the purl row! I knit my 7 sts on then purl the rest of the way! I use my contrasting color to do these rows! hope this helps! Hi did you get the pattern for the children’s Mittens? Hi i googled Baby/Toddler Newfie Mittens and A pattern should come up!! I use a 3.75mm needle for the cuff and a 4mm for the rest of the mittens! I use Knitting Worsted Yarn for mine!! good luck and happy knitting!! is there not a pattern for the left mitt and one for the right? Hi Darlene you use the same pattern for both hands!! Good luck !! you are welcome Happy Knitting!! it appears that both mittens are for the right hand. Left hand doesn’t feel right in the mitten. it will fit the left hand too !! I have made many of these and they are for either hand!! Good Luck and Happy Knitting!! Thanks so much for posting this pattern. I just finished a pair for my teen daughter and she loves them! a small bit extra. I actually loved every single element of this blog post. you are welcome hope they turn out for you!! Happy Knitting!! I’m trying to use yarn already in my stash…could you tell me approximately how much yarn you use (both A and B colors) to knit these gorgeous mittens? Hi Kristen I never really measure out how much yarn I use It depends on the size you are knitting!! I use 1 ball of the main color and less for the second color of knitting worsted yarn which has about 5 ounces for a Child’s mitten !! Hope this helps you !! Good Luck and Happy Knitting!! Could these mitts be knit on a round needle? Yes of course, a small length needle or using the magic loop technique http://www.youtube.com/watch?v=PC7f9fn9wfk or constantly pulling out the extra length of needle that isn’t needed. In this newfie pattern there is a multiple of 6 sts, but in the next section there is a mulpitple of 6 sts plus K1 at the beg. Where did the K1 come from? This is allowing the pattern to be offset, so the squares don’t line up but alternate each section. The K1 comes off the end. Of course now that you mention it, I bet that is supposed to be K2! I’m going to have to reknit these mitts soon!! Hi the pattern is as it is written the second pattern starts out with K1 then slip 2 sts as if to purl then continues on at the end of the third needle you will end up with k 3 then goes onto the pattern! good luck hope this explains it to you! Happy knitting! no problem hope it is working out for you now! Just had to write and tell you we were visiting Nova Scotia many years ago and stopped at a yard sale and the woman had several baby size pairs of these for sale. I had never seen them before and asked if she had a pattern for them. She was so nice and said as soon as she was finished waiting on a customer, she would go in and make me a copy. She did this and at the time I wasn’t knittin a lot and have looked at them over the years. Now that I’m retired and do charity knitting, it’s time. I just wanted you to know how kind and polite we found the people in Nova Scotia. Love making the mitts but find they knitt up tight especially around the thumb area i wonder what i am doing wrong? Sounds like you either knit tighter or have slightly larger hands. Try using a larger needle or add another repeat of the pattern (use 6 more stitches). When picking up stitches to knit around thumb pick up more stitches than noted. 2 or 4 more or whatever you need for your mitts to be comfortable for you!!! Thanks, for the advice.much appreciated. go, we can always go back at any time. are on their third pair, cause they have outgrown them. I have made so many colour combinations in my 12 dozen projects so far! I really hunt to find good colour combos, because I want them to appeal to buyers at the Craft Sale at church. So far so good! 6 dozen sold at church last year, 2 dozen became Christmas gifts I gave away, another 4 dozen ready for the November sale this year! That is a fair price , they are time consuming, & also big demand, everyone wants a pair. Good knitting. long time ago I saw the pattern for the mitts in Canadian Living but never knitted, back in 2001 we visited Nfld and I was so happy to find them and bought a pair and they are so warm. Well this winter I lost one of the mitts I:m heartbroken,but a friend of mine is visiting Nfld and she will bring a pair home for me.The mitts I bought had what seemed to be lambswool as one of the second colours. Do they still make the mitts with the lambswool in them? I have started to knit the mitts but I would like to know how to insert the thums\ I am going to use Alpaca for the thrums. So excited to find this! Aiti (means mother in Finnish, but she was my mother’s mother) made a pair for my mom decades ago – 1930s or 40s? Though I’ve crocheted since college (back when bricks were first invented! ), I’m now in a weekly group of women who are encouraging my knitting skills. Looking forward to upping my game so I can make these! Hi! I live in Atlantic Canada, with hubby and 2 cats. For more info see my 'about' page in the tabs above. I am finding I don't have the time to devote to this blog that I wish I did. Since I don't want to write a few lines on trivialities, I will write good pieces when I am able which may be monthly or not! If frustrated by the lack of posts, a feed reader will let you know when I have a new posting. To hubby for all his emotional and tech support. Without it, I wouldn't be the person I am today and I couldn't possibly be savvy enough to blog.